Competitive eating vies with family expectations in a funny, heartfelt novel for middle-grade readers by National Book Award winner Pete Hautman. Pete Hautman is the author of many books for young adults and adults, including the National Book Award–winning Godless, the Klaatu Diskos trilogy, and Eden West. Pete Hautman divides his time between Wisconsin and Minnesota. Jack-of-all-genres Hautman turns to the mouthwatering, madcap world of competitive eating...With crystalline prose, delectable detail, rip-roaring humor, and larger-than-life characters, Hautman gracefully examines what it means to be a friend, a family member, and, through it all, a kid trying to do the right thing. Readers will race to devour it, but like Papa Pigorino’s colossal BDT pizzas, this infectious tale is a thing to be savored. This novel is laugh-out-loud funny and genuinely sweet. Though the premise of scarfing down pizzas seems silly, this is ultimately a meaningful book with insight into having a sibling with special needs and the general ups and downs that come with being a teenager. A fantastically funny, relatable book that will be an easy sell and a rewarding read for most middle graders. Hautman (Eden West) is both funny and uplifting in this good-natured story of incoming high school freshman David Miller, whose chief talent is the ability to eat an entire pizza in under five minutes...Hautman offers lots of great takeaways about loyalty, friendship, and perseverance, wrapped in a wholly enjoyable story about a kid who, in the end, just loves to eat pizza. The first-person narrative explores the two brothers’ relationship in a nuanced way...David becomes more attuned to Mal’s perspective and ways of communicating. ...the book could be used in group or classroom reads as it could foster good discussion questions. Family relationships and buddy support are authentically drawn, and the bones of the plot are sturdy...the resolution is satisfying and readers will come away thoroughly entertained. Even if they take a pass on pizza and burgers for a couple of days. Winning views of a family pulling together, of young people stumbling into adolescence, and of an entertaining if controversial pursuit, "reverse-eating events" and all. Only an author as talented as Hautman could juxtapose eating contests with caring for an autistic 10-year-old. Let’s turn now to the year’s two most refreshing narrators, David Alan Miller and Shane Burcaw. 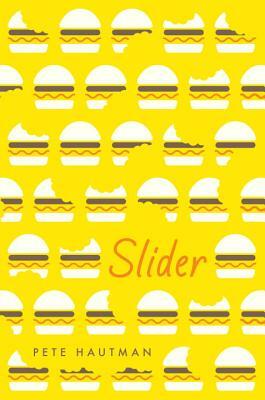 David is an eighth-grader with an amazing talent for competitive eating and the fictional hero of Pete Hautman’s heartfelt middle-grade novel “Slider” (Candlewick)…David isn’t a character you meet every day.